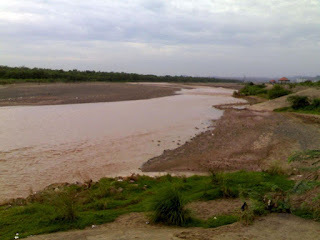 The Centre and the Government of Haryana joined hands to revive the long lost River Saraswati and provide water to the drought-prone areas of India. Union Minister of State for Petroleum and Natural Gas (Independent Charge) Dharmendra Pradhan and Haryana Chief Minister Manohar Lal Khattar witnessed the signing of the 'Memorandum of Agreement'. The MoA signed today will not just increase the availability of water in the region but will also help in efforts towards rediscovering the lost lineage of Saraswati River. The Action Plan aims to transform cross-border clearance ecosystem through efficient, transparent, risk-based, co-ordinated, digital, seamless and technology driven procedures which are supported by advanced sea ports, airports, and land borders. The NTFAP aims to achieve improvement in ease of doing business by reducing cargo release time and cost, promote paperless regulatory environment, transparent and predictable legal regime and improved investment climate through better infrastructure. Paika uprising was in the nature of a rebellion by people of Odisha. 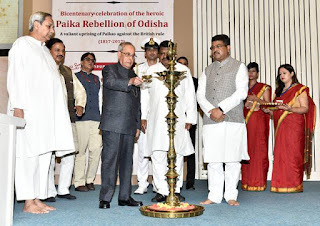 It was aimed at upholding the rights of the Odia people and sovereignty of Odisha.Paika Rebellion was not only the rebellion of Paikas, it was a National War waged by ordinary people at the grassroots level who resented the dispossession of their Sovereign of his rights and the consequential repressive measures that followed. 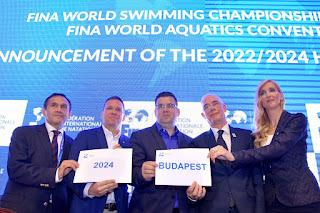 Hungary — Russia and Hungary will host two future editions of the world championships in short-course swimming. Swimming’s world governing body, FINA, says Kazan will host in 2022 and Budapest in 2024. They beat bids from Hong Kong and Taipei City. The 25-meter pool championships are staged every two years in December, and include hosting the FINA World Aquatics Convention. The decision was announced in Budapest, which is currently staging the two-yearly world championships over the full 50-meter distance. Kazan in the Russian region of Tatarstan staged the previous 50-meter worlds in 2015. 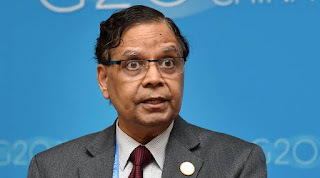 India has presented its national review report on the implementation of the Sustainable Development Goals (SDGs) to the United Nations (UN), emphasising that as the fastest growing major economy it is uniquely placed to deliver on its commitments. The report details various measures and programmes being implemented across India towards achieving the core objectives ambitious global goals. These include poverty eradication, economic growth, ending hunger and achieving food security, gender equality, promoting inclusive and sustainable industrialisation and climate action. The programmes highlighted in the report are the ‘Mahatma Gandhi National Rural Employment Guarantee Act’, ‘Beti Bachao Beti Padhao’, ‘Sagarmala’, ‘Clean India’ campaign and the Aadhaar Act. India claimed a gold and a bronze at the China World Para Athletics Grand Prix being held in Beijing. Ramudri Someshwara Rao won a gold medal in the 200m race and Hokato Sema bagged a bronze in shot put. 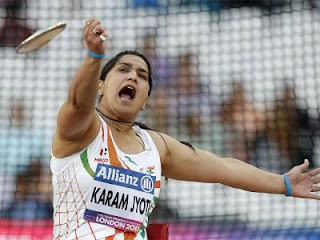 Both have qualified to represent the country in the IPC Para Athletics World Championships in London later this year. Someswara Rao had become the fastest Indian blade runner in the recently concluded 17th National Para Athletics Championships at Jaipur. Sema had also won a gold in his event. Bank of BarodaBSE -0.12 % has entered into an agreement with Directorate General of Supplies & Disposal (DGS&D) for extending various banking services to Government e-Marketplace (GeM). DGS&D has been mandated to set up GeM, an initiative intended to bring greater transparency and efficiency in public procurements, BoB said in a statement today. The GeM SPV has been established as National Public Procurement Portal to provide an end-to-end online marketplace for central and state government departments, their public sector undertakings, autonomous institutions and local bodies, for procurement of common goods and services in a transparent and efficient manner. 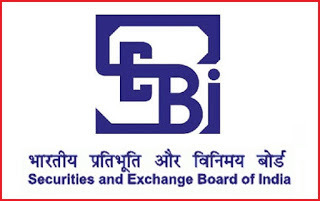 Markets regulator Sebi has entered into a pact with the European Securities and Markets Authority (ESMA) for exchange of information concerning Central Counterparties (CCPs). Central counterparties are entities that help facilitate clearing and settlement activities. The Memorandum of Understanding (MoU) has been signed between the Securities and Exchange Board of India (Sebi) and ESMA under the European Markets Infrastructure Regulation (EMIR). EMIR provides for signing of a cooperation arrangement between ESMA and the relevant non-EU authorities, whose legal and supervisory framework for CCPs have been deemed equivalent to EMIR by the European Commission. Indian Oil Corporation (IOC) is ranked highest at 161st among Indian firms, while another state-run firm Oil and Natural Gas Corporation (ONGC) has moved out of the rankings for 2016. Private gems and jewellery major Rajesh Exports has made its debut at 423rd position. Among the seven Indian companies, four are from the public sector while Reliance Industries (RIL) is the top-ranked among private sector firms, followed by Tata Motors and Rajesh Exports. Among state-run majors, IOC is followed by banking behemoth State Bank of India, Bharat Petroleum and Hindustan Petroleum. The seven companies and their rankings are IOC: 161st, RIL: 215th, Tata Motors: 226th , SBI: 232nd, Bharat Petroleum: 358th, Hindustan Petroleum: 367th, Oil and Natural Gas, Corporation: 426th. 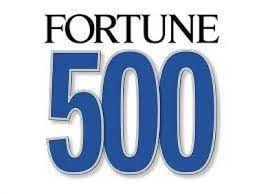 The overall list was topped by Walmart with revenue of $482,130 million, followed by State Grid (revenue of $329,601 million) and China National Petroleum ($299,271 million) at the second and third place respectively. Adobe Systems Inc. on Friday said it has appointed Shanmugh Natarajan as the managing director (MD) for Adobe Systems in India. Natarajan will continue to lead R&D and operations for Adobe India while Kulmeet Bawa, MD, South Asia will continue to lead Adobe’s field operations. Brenda Hale has been appointed as the first female president of the UK supreme court. 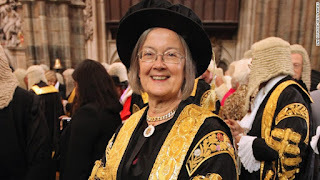 Lady Hale is a longstanding champion of diversity in the judiciary. She has previously said the court should be ashamed if it does not improve its record on the issue. She will take up the role on 2 October, when she will be sworn in as president. Hale’s appointment was announced alongside that of Jill Black, who, after promotion from the court of appeal, becomes the second female justice in the UK’s highest court. Two other court of appeal judges, David Lloyd Jones and Michael Briggs, were also appointed to the supreme court on Friday. A family law expert, Hale joined the supreme court in 2009 and is among the last of the judges who can serve to 75 as she became a judge before rules were changed in 1995 to make retiring at 70 mandatory. 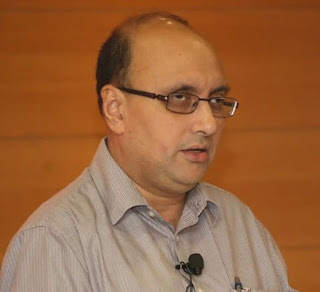 Senior Indian analyst and a fellow of Observer's Research Foundation (ORF) Ashok Malik has been appointed as the Press Secretary to President by the Union Cabinet. The Appointments Committee of the Cabinet approved his appointment on Friday for a period of two years. A journalist for 20 years, Malik is a columnist for several leading Indian and international publications including Times of India, Hindustan Times and YaleGlobal Online. 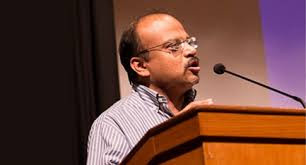 Previously, he served as a consulting editor to the Pioneer and Tehelka.